In a small glazed cabinet near the north door of Holy Trinity Church in the Warwickshire village of Stratford-upon-Avon, the long narrow volume of the parish register lies open at the page on which is inscribed in clear, clerkly hand the record of the christening of William Shakespeare, April 26, 1564. Tradition, which delights in coincidences, has selected as his birthday the anniversary of his death, which occurred April 23, 1616, but the date is unknown. His lineage was humble and his origin obscure, his ancestors having been tenant farmers and small tradesmen in the same locality, without wealth, education, estate, or public station. No other of the name has reached special distinction before or since. His grandfather, Richard, was a yeoman at the neighboring hamlet of Snitterfield. His father, John, who appears, from the vague glimpses of his history discernible, to have been of an ardent, careless, and improvident nature, removed in early life from the farm at Snitterfield to Stratford, where he kept a country store. He prospered in business for a while and was active in local politics, rising through the successive gradations of leet juror, constable, and alderman to high bailiff in 1568, although unable to write his own name. He married, in 1557, Mary Arden, the daughter of his father's landlord, who brought him as dower about sixty acres of land and the equivalent of $200 in money. His pride was apparently inflamed by political success, and he applied to the Herald's College for a grant of arms, which was refused. From this time his fortunes rapidly declined. He mortgaged his property, squandered his wife's inheritance, was sued for debt, disregarded his social and religious obligations, and became so indifferent to decency that he was fined by the town authorities for neglecting to remove the filth and refuse of his household from the street in front of his own door. He died in 1601, his later years having been passed in honor and comfort through the efforts of his son, who had already acquired wealth and fame. 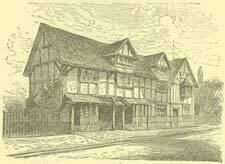 The homestead of John Shakespeare, in which he lived and carried on his business, still stands on Henley Street, in Stratford, much the same as it was four hundred and fifty years ago. It is a paltry hovel of two low stories, half timbered, with meagre windows, and must have been a squalid abode even in its prime. It is built flush with the sidewalk, having neither vestibule nor entry, and the rough broken pavement of the kitchen is sunken a step lower than the street. A huge open fireplace of unhewn gray stones yawns rudely in the wall to the right, and a narrow door leads to a smaller apartment in the rear. Immediately above, reached by a precipitous stairway, is the bleak and barren chamber, dimly lighted, the legendary birthplace of the poet. The dwelling is more like the cavern of a savage than the residence of civilized man. Making due allowance for the conditions of domestic life and architecture in the reigns of Elizabeth and James, it is difficult to imagine a home more rude and primitive, more destitute of comfort and convenience, more indicative of poverty and social inferiority. The rough-hewn oak of the frames and timbers and the coarse mortar of the plastered spaces show no more decoration or ornament than the frontier dug-out on the plains of Dakota or the miner's cabin in the gulches of Montana. In this environment William Shakespeare, the third child and eldest son of eight children, was born and lived till the age of eighteen years. Of his companions, his studies, his pleasures nothing is known. A few doors from his father's house still stands a group of gray buildings, worn, bleached, and washed like skeletons by the storms and suns of eight centuries: a chapel with pointed windows and low square tower, a hall and the alms-houses of the ancient guild. In the second story of the hall was the endowed grammar school of Stratford, restored by Edward VI. in 1553, and the uncouth, venerable desk at which Shakespeare is said to have studied is included among the few unauthenticated relics in the museum at the homestead. It is a reasonable inference that whatever education he received was obtained here, but this fact, as well as the character and amount of his early training, is wholly conjectural. The first formal separate biography of Shakespeare was published in 1743, one hundred and twenty-seven years after his death, by Rowe, who says that the boy was withdrawn from school in 1578 to assist his father in the drudgery of the shop and farm. Other mouldy gossip makes him a butcher's apprentice, a country pedagogue, and a lawyer's clerk, arrested for poaching, addicted to carousing and the boorish pleasures of the country-side. 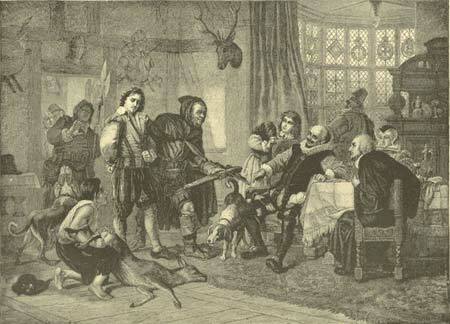 Shakespeare arrested for Deer Stealing. A little distance westward from Stratford by a footpath winding through pleasant fields lies the hamlet of Shottery, in the edge of which, with its gable to the highway, stands the cottage of Richard Hathaway, as humble in its architecture and accessories as the Shakespeare abode. The entrance is through a rustic garden with pinks and marigolds bordering the narrow way, and a covered well before the door. November 28, 1582, the Bishop of Worcester granted a license for the marriage of "William Shagspere and Anne Hathwey" upon once asking of the banns. The bridegroom was eighteen and the bride twenty-six. By this act William Shakespeare assumed the paternity of a daughter born six months afterward, and baptized Susanna, May 26, 1583. The only other children born of the marriage were twins, Hamnet and Judith, christened February 2, 1585. The two daughters survived their father, but Hamnet died at the age of twelve. Thus two months before he became of age Shakespeare found himself a cadet of a ruined house, the parent of three children, with no business, trade, or fortune, and the compulsory husband of a woman old enough to have been the wife of his father. Where and how they lived has not been discovered. The mature age and premature maternity of Mrs. Shakespeare justify inferences which his mysterious departure for London does not weaken, and his long absence, his infrequent visits to Stratford, the Duke's injunction to Viola--"let still the woman take An Elder than herself"--and the ironical bequest of his second best bed, neither diminish nor destroy. The seven years succeeding the birth of Hamnet and Judith are a blank in Shakespeare's biography. He disappeared even from the reach of rumor and tradition. One hundred and fifty years after his death Oldys, the antiquarian, exhumed an ancient legend, to the effect that he fled to London to avoid the consequences of lampooning a neighboring nobleman who had prosecuted him for killing a deer in his park, and sought employment at the theatre. Unsupported anecdotes represent him as holding horses at the door of the play-house, then as a servant to the company, and at last as general utility man on the stage. As an actor he made no impression, although he continued to appear in subordinate parts, and played in Ben Jonson's "Sejanus" at its production in 1603, when he was forty years old. The first public notice he received was in 1592, in a letter of Robert Greene, a dissolute writer, who accuses Shakespeare and Marlowe of plagiarism, conceit, and ingratitude. Chettle, the publisher, soon afterward printed a retraction so far as Shakespeare was concerned, and eulogized his manners, his honesty, and his art. Our acquaintance with his life of twenty years in London, which closed probably in 1613, is almost exclusively confined to the appearance of the plays and poems bearing his name, and the date at which these were produced is generally a matter of surmise or inference. During this interval he became a large shareholder in two theatres, speculated in real estate, loaned money, grew rapidly in wealth, and was a man about town. He belonged to no church, nor to any political party, and sustained no recorded relations with the scholars, soldiers, or statesmen of his time. The two volumes of poems, "Venus and Adonis," and "Lucrece," were published respectively in 1593 and 1594, and the "Sonnets" in 1609. The dramas were acted between 1587 and 1612, and are grouped by critics in four periods of intellectual growth and development. They are of unequal excellence. Some are mere versions and adaptations. The plots and stories are generally borrowed. Some of the worst are unspeakably bad, but the best, with their subtle and imperious command of language, stately and splendid imagery, careless opulence of incident, learning, and illustration, wit, wisdom, humor, and philosophy, insight into the complex abysses of human passion, familiarity with the secret motives of human conduct, and profound meditation upon the most sombre problems of human destiny, mark the highest elevation yet reached by the human mind. No edition of the plays was collected during Shakespeare's lifetime, nor until seven years after his death. His heirs and executors made no claim to supervision nor ownership. He took no apparent interest in them, nor corrected, nor revised them for publication. He left no indication by which the genuine could be discerned from the spurious, and was apparently indifferent to literary reputation. Unlike many of his great contemporaries in that luminous epoch, there was little of the Bohemian in Shakespeare. He attended strictly to business, and grew in prosperity as he increased in fame. Marlowe, Massinger, Ford, Decker, Middleton, Webster, and others of his associates led precarious and irregular lives as hack-writers for the stage, but Shakespeare, in his triple functions as actor, author, and shareholder of the Blackfriars and the Globe, rapidly acquired a fortune. As early as 1597, after ten years in London, at the age of thirty-four, he had amassed enough to enable him to buy New Place, the largest mansion in Stratford, built by Sir Hugh Clopton, and from time to time he added to his possessions by the purchase of real estate and tithes, till he became the wealthiest citizen of his native town. He was also the owner of improved property in London, near St. Paul's Cathedral, bought three years before his death. No doubt the bitter recollections of the privations of his childhood, and the humiliations resulting from his father's heedless improvidence, stimulated his purpose to retrieve the misfortunes of his family, establish them in comfort and dignity amid the familiar scenes of his youth, and retire from the scene of his triumphs to the shadowy forests and sylvan vistas of the Avon, where his life began. The "Great House" in New Place, where Shakespeare led the life of a country gentleman after breaking the magician's wand, like the other residences in Stratford, must have stood even with the street, for the brick arches of part of the foundation, and fragments of the side and cross walls remain, being covered with iron gratings to prevent depredation. The curb and canopy of the well from which he drank are draped with clustering vines. It was a modest domain of small area, and is now a grassy lawn surrounded by an iron paling. After the death of Shakespeare's granddaughter, Lady Bernard, in 1670, the house was sold to a descendant of its original owner, and finally became the property of Rev. Francis Gastrell, who, in 1756, cut down the mulberry-tree planted by Shakespeare, because he was annoyed by the curiosity of visitors, and in 1759 razed the house to the ground on account of some controversy about taxes with the local authorities. The museum of relics and curiosities in the rooms adjoining the kitchen and chamber above, in the house of John Shakespeare, contains early editions of the plays, unimportant engravings, a ring with the initials W. S., a chair, and a sword supposed to have belonged to the poet, some contemporary deeds and writings, and a letter to him from a neighbor entreating the loan of thirty pounds. Few traces of his closing days in Stratford remain. He was an exacting creditor, had some trivial transactions with the corporation, and took an active interest in municipal affairs. He died suddenly, April 23, 1616. His son-in-law, Dr. John Hall, the husband of Susanna, was the leading physician of Stratford, and a practitioner of considerable repute. He left notes of important cases in which he officiated, and their treatment. He would naturally have attended Shakespeare in his last illness, but he makes no mention of the case, nor of the cause of his death. Reverend John Ward, who was vicar of Stratford nearly fifty years afterward, wrote in his diary--"Shakespeare, Drayton, and Ben Jonson had a merie meeting and it seems drank too hard, for Shakespeare died of a feavour there contracted." The old sanctuary in which he was buried is a noble specimen of decorated gothic architecture, a cruciform structure of yellowish-gray stone, with low eaves and broad sheltering roof, from the midst of which rises a square battlemented tower with slender pointed spire. It is approached by a paved stone path bordered with limes, leading from the highway through the graveyard where, beneath a twilight of shade, many generations of the rude forefathers of the hamlet sleep. Along the venerable aisles of the nave and in the transept, are effigies and memorial tablets disclosed in the dim religious light. The chancel is disproportionately spacious and has high stained-glass windows at the sides and end. In front of the altar, beneath slabs of gray stone, are the graves of Shakespeare and his family. The widow, who survived him seven years, lies nearest the wall, and on the other side Susanna and her husband, Dr. Hall. The removal of the dust to Westminster Abbey has been prevented by the profane imprecation of the inexplicable epitaph by which the tenant of the tomb, as if in anticipation of the irreconcilable mysteries posterity would discover in his history, bequeathed an undying curse to him who should disturb his repose. Some distance away, and at a considerable height in the north wall of the chancel, upon a bracket between two windows, is a half-length bust of Shakespeare with a pedantic Latin inscription. It was placed in 1623 by Dr. Hall, and being so nearly contemporary, may be considered a portrait. A few years ago the church authorities permitted an American artist to erect a platform from which to study the work minutely. He found one cheek-bone higher than the other, and was of opinion, from the position of the lips and tongue, that it was modelled from a cast taken after death. It is a beefy, commonplace countenance, heavy, dull, and vacant, rendered trivial and conceited by foppish mustaches curled up beneath the nostrils. It bears little resemblance to the familiar Droeshout portrait engraved for the first edition of the plays, and still less to the so-called Stratford portrait exhibited at the museum on Henley Street. This picture was discovered many years ago in the shop of a London antiquarian by an unknown person, who thought the upper part of the head resembled Shakespeare's. The face bore a heavy beard, which was supposed to have been added to save the work from destruction by the Puritans! As the incidents are related there is no evidence of its genuineness or authenticity. One of the chief attractions of the Memorial Museum in the lovely park near the church, on the banks of the Avon, is a series of photographs of a plaster cast purporting to be a death-mask of Shakespeare, now in the possession of some German potentate, which one of the most eminent English judges declares to be established by evidence sufficient to maintain any proposition in a court of law. It should be genuine, if it is not, for it represents the loftiest and noblest type of the Anglo-Saxon race. The other portraits are vapid, affected, and conventional, without character or expression; but this is superb. The broad imperial brow, the firm, aquiline, and sensitive nose, the mouth proud, humorous, and passionate, the full orbits of the eyes, and the resolute, massive jaw, all indicate a temperament and brain of which the greatest deeds in letters, arts, or arms, might be confidently predicted. A few weeks before his death Shakespeare made a will, bequeathing all his landed property in strict entail to his eldest daughter. This document is preserved at Somerset House, a vast government building in London, adjoining Waterloo Bridge, between the Strand and the Victoria Embankment, where the probate records of the kingdom are deposited. It is locked in a buff leather case with an engraved inscription on a brass disk on the lid. It is written on three large square separate sheets of heavy paper, discolored by time. Each sheet is laid flat and sealed between two plates of clear glass, so that both sides can be inspected. The handwriting of the scrivener in the body of the instrument is quite distinct and legible, considering its antiquity. The signature of Shakespeare appears at the bottom of each sheet. The chirography of men of genius is proverbially bad, generally from its fluent facility, but the autographs of Shakespeare are clumsy, uncouth, and awkward, their disconnected and sprawling letters seeming to have been formed with difficulty by fingers unfamiliar with the use of the pen. They may perhaps have been written in an unaccustomed position, or when the testator was enfeebled by disease. It could not have been the infirmity of age, for he was but fifty-two when he died. It is impossible to look at these signatures without receiving the impression that they were written by an illiterate man. It is not merely their illegibility, but they have the scrawly curves and uncertain terminations of the penman who is not certain about the spelling of his own name. The great collections of London contain many manuscripts of celebrated authors, ancient and modern, and some that are hard to decipher, but there is no chirography more hopelessly and irreclaimably unlettered and unscholarly than that of William Shakespeare. At the shrine by the placid Avon, which the centuries have invested with their pensive and resistless charm, and over which genius has cast its enchanting spell, an impassable gulf seems fixed between the Shakespeare of Stratford and the Shakespeare of London. They appear like two entirely different and almost irreconcilable personalities. All that is known of either renders all that is claimed for the other improbable. Many dual lives have been lived before and since, but none seem so incompatible as these. It is unlikely that the claim of Shakespeare to the authorship of the dramas that bear his name will ever be overthrown. His title has been too long conceded to be successfully contested. That he wrote them can now be neither proved nor refuted, but there are inherent improbabilities that must always make the Shakespearean legend a profoundly fascinating subject of psychological consideration. And were he to be dethroned, to whom should the sceptre and the crown be given? Lord Bacon had a kingly soul, capacious great thoughts, and high designs, but no one who has read his metrical translation of the Psalms of David will be troubled again with doubts whether he was the writer also of "Macbeth," "Othello," and "Lear." Compared with these sterile, bald, and mechanical quatrains, the sacred hymns of Isaac Watts are howling and bacchanalian anacreontics, to be hiccoughed by drunkards in their most abandoned hours of revelry. Pondering upon the mystery as I walked up and down beneath the flaring lights, on the windy platform at Bletchley, waiting, after a day at Stratford, for a belated train to London, I reflected that genius has no pedigree nor prescription, and that at last the greatest marvel was, not that the tragedy of "Hamlet" was written by Shakespeare, but that it was written at all.